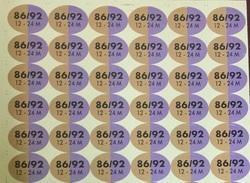 Matching up with the exact requirements of customers, we are involved in presenting a wide array of Hanger Sticker. We are a renowned name, which is engaged in offering a wide and comprehensive range of Hanger Stickers. Hanger stickers are basically for identification of sizes as the garments are displayed in the showroom. As per the distinguished and changing requirements of our customers, we have come up with a huge collection of Hanger Stickers. We offer Hangers Sticker. 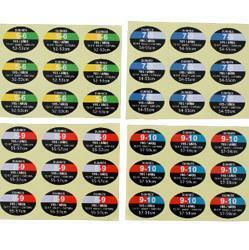 We are named as one of the overriding Hangers Stickers Manufacturers from India. We offer an inexplicable range of these Stickers that are lively and attractive. These are designed in novelty of designs and captivating patterns. We are instrumental in manufacturing a pristine array of self adhesiveness Hanger Stickers, which is used to tag garments, poly pouches and hangers. Vision Labels India Pvt. Ltd.